Summer Backyard Nighttime Sky in New Jersey. Star, Moon, Jet, and Firefly Trails. A composite of 980 images looking south taken before midnight. I used the Startrails program for creating the composite. I had actually gone out to see what type of video I could take of the moon using the D3s camera and a telephoto lens. The moon phase (according to the US Naval Observatory site) is waxing gibbous (76% illuminated). I started by shooting some single images and found that ISO 200, 500 mm, f/8, 1/50 second should be about right. Even though I had the camera set to shoot in manual mode, all of the images of the moon were way over exposed. It didn’t appear that I had manual control while taking the video. I made sure that the ISO setting was fixed (not Auto), that Active D-Lighting was off, and that the white balance was fixed (4000 K). I need to try this again! Star, Moon, Jet, and Firefly Trails. Summer Night in New Jersey. Image taken with a Nikon D3x and 14 mm f/2.8D lens (ISO 200, 14 mm, f/4, 8 sec). 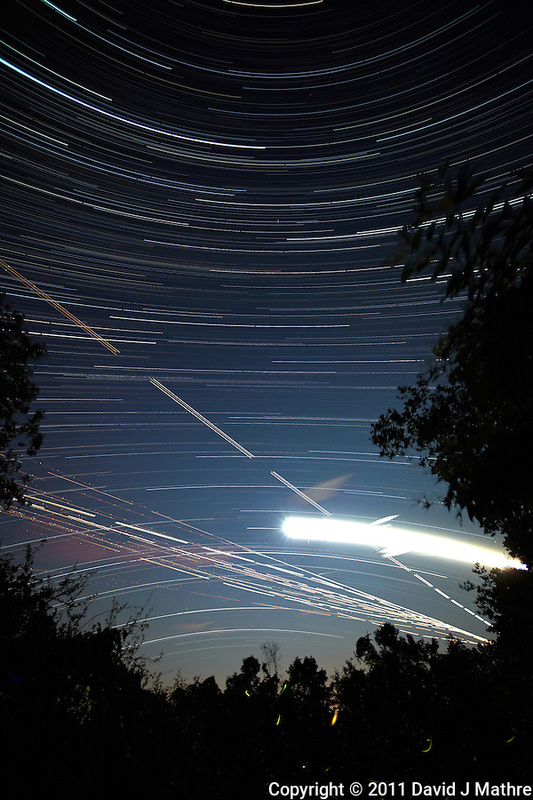 Composite of 980 images combined using the Startrails program.